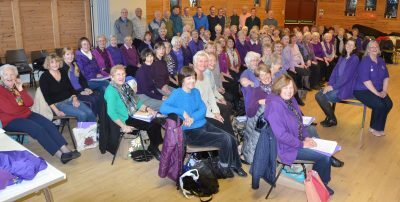 Monday Afternoon Poynton Singers (MAPSingers) was the first choir to be launched under the Cantata banner and started in March 2009. Based in Poynton this is our largest choir with over eighty voices. We sing a mixture of SAB and SATB music from a wide variety of genres. The choir meets on Monday afternoons from 2.00pm to 3.30pm and rehearsals are followed by the compulsory brew and a biscuit! £5 a session paid in half-termly blocks but new members can pay weekly for their first half term whilst making their minds up. The fees include the loan of a folder and all the music and the choir performs, on average, two concerts a year. New members are welcome, but it’s always a good idea to contact us first so we know to expect you. Please get in touch by clicking here.